Ladies Oversized DERBY HATS: Perfect for The Music Man & many other Broadway Production! Huge Derby Dame Hats are Plentiful at Dallas Vintage Shop! Ladies Oversized Derby Hats are Perfect for The Music Man Broadway Production! These Huge Derby Dame Hats are Plentiful at Dallas Vintage Shop! Kentucky Derby Dame Hats are plentiful at Dallas Vintage Shop. We also have an enormous selection of quality Derby Dame hats in all sized from wimsies to normal sized. Posted in Derby Dame Hats, Derby Dames, Hats Ladies, Kentucky Derby, Lone Star Park Derby Day Hats, Music Man | Comments Off on Ladies Oversized DERBY HATS: Perfect for The Music Man & many other Broadway Production! Huge Derby Dame Hats are Plentiful at Dallas Vintage Shop! For Kentucky Derby Prize Winning Hat, there is no better than Dallas Vintage Shop. If you want Bodacious Derby Dame Hats or simple understated ones, we have the selection and quantity you need. We’ll even help you the extras to help you customize your hat to match your dress or shoes. Fabulous Derby Dame Hats, Ridiculously Enormous Selection, from Whimseys to Ginormous. We have Fabulous Derby Dame Hats. You will find our Ridiculously Enormous Selection is complete and encyclopedic in scope: from Whimsy to Ginormous, English to International, Basic to Ostentatious, all Periods from primitive to Victorian to Trendy. Posted in Derby Dame Hats, Derby Dames | Comments Off on Fabulous Derby Dame Hats, Ridiculously Enormous Selection, from Whimseys to Ginormous. 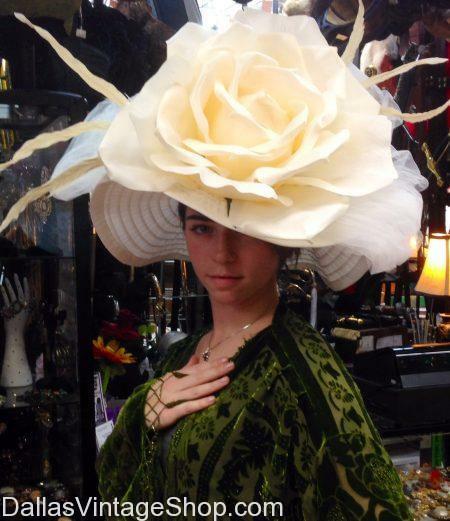 We have so many Lovely Floral Kentucky Derby Hats that the choices will overwhelm you. Make sure you arrive with plenty of time to see them all. Horse Racing Spring Fashion Hats and Dresses are abundant here. Its time to start your Derby Dame Hat Shopping and Dallas Vintage Shop has unlimited styles and many ways to personalize and dress up your hat to match your dress, or shoes, or purse, etc. Oh, we also have all those accessories you need to compliment your hat and make your outfit perfect. You may want to chek out our alarmingly huge selection of Kentucky Derby Hats. Ladies and Gentlemen the horses will run at Lone Star Park as usual so time to wear those Ladies Derby Day Hats. 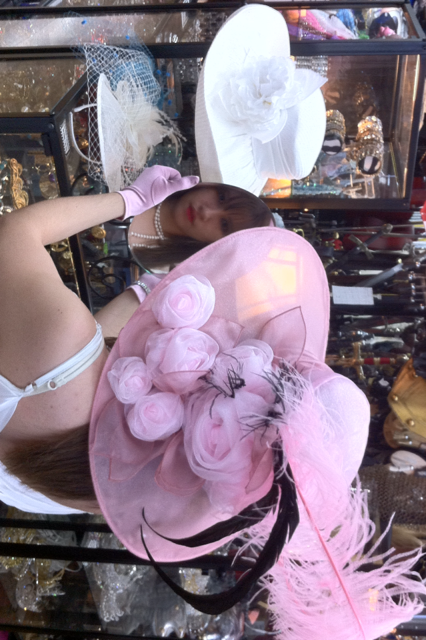 Dallas Vintage Shop is the Largest Ladies Hat Shop in the Dallas Metroplex. Come see our enormous selection of Extravagant Ladies Hats that are perfect for the Lone Star Park Celebration of the Kentucky Derby. Girls Day Out: Lone Star Park Kentucky Derby Day. Have fun shopping our amazingly huge selection of gregarious Derby Day Hats. We have plenty of choices for the gloves, dresses, jewelry, vogue large sunglasses and so much more to compliment your unique hat. Find Bodacious Kentucky Derby Hats at Dallas Vintage Shop. Are you ready for the Lone Star Park-Kentucky Derby Day Hat Contest . Our Derby Day Hats are Ready-Are You? SHOW-OFF: Kentucky Derby Day at Lone Star Park in Grand Prairie: Dallas Top Hat Shops. SHOW-OFF: Kentucky Derby Day at Lone Star Park in Grand Prairie: May 5, 2018. Find plenty or huge beautiful Derby Hats for Kentucky Derby Day at Lone Star Park in Grand Prairie on May 5, 2018. Posted in Derby Dame Hats, Derby Dames, Grand Prairie, Kentucky Derby, Lone Star Park Derby Day Hats | Comments Off on SHOW-OFF: Kentucky Derby Day at Lone Star Park in Grand Prairie: Dallas Top Hat Shops. You are in Derby Dames category.